Solid graphics, with a Cape style lighthouse providing an atmospheric regional identity. Little fuss, with brand, style, flavor and benefit (All Natural). Striking colours. As good as it gets. 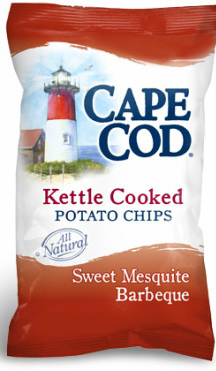 Good, solid crunch, helped along by by a thick kettle cooked chip. The crunchiness made it feel fresh. Kettle cooked, so a little greasy, but also thick. Most notable was an impressive orange tinge to the color, which emphasised the flavor, as did the flecks of seasoning residue which remained on your fingers. An aromatic chip that smelled of barbeque, if not quite mesquite. It matched the smell with a pleasant sweet barbeque taste, that provides more of a hint of spicy mesquite by inference rather than in actual flavor.